Spain is just as famous for its countless crazy festivals as it is for its spectacular beaches, vibrant nightlife and world-class luxury hotels. Right across the country, towns, villages and sometimes simply city neighbourhoods come together once a year to host their own celebrations, for the most part carrying on traditions dozens, if not hundreds of years in the making. 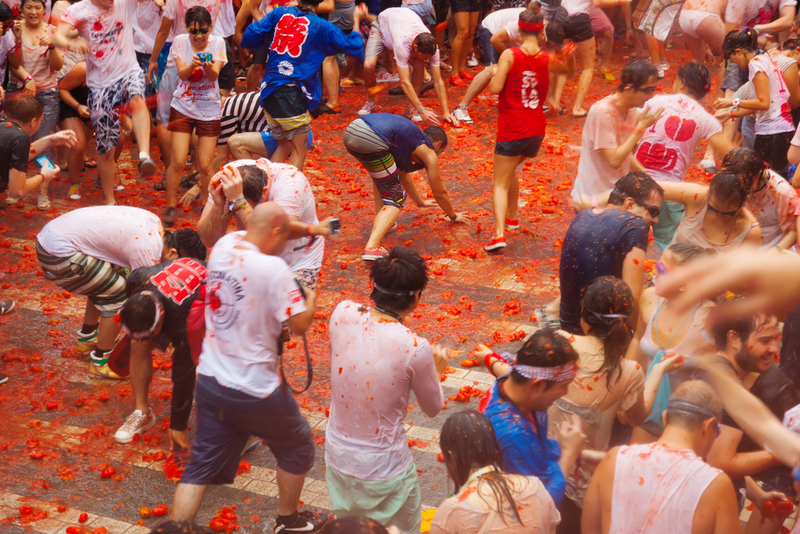 But, while it may not be the oldest of Spain’s many festivals, few can match La Tomatina for downright craziness. In fact, it’s no surprise that this annual event is on so many people’s Spanish bucket list. You don’t need to speak fluent Spanish to work out that the festival is centred around tomatoes. A lot of tomatoes – 145,000 kilograms to be precise. Quite simply, every year, on the final Wednesday of August, the small town of Buñol, just off the coast in the Province of Valencia, welcomes visitors from right around the world as they get rid of over-ripe tomatoes in the messiest way possible. With everyone crowded into the main square, one local inhabitant attempts to climb a greasy pole. As soon as they reach the top, that’s the sign for a massive food fight to begin. The rules are simple: only tomatoes can be thrown, and these need to be squashed before they are launched. A second signal marks the end of the action, and then the local fire brigade come and spray their hoses on the participants before the fiesta carries on in the traditional bars of Buñol. These days, La Tomatina – which was only established in the 1940s – is a ticketed event, though numerous tour companies offer packages to the town and return travel to Valencia, where a messy day can be rounded off with a lazy dinner in the cathedral square and a night of pampering in a luxury hotel like Angla Boutique Apartments Valencia on the Mediterranean coast.